The new year is coming, folks, and here’s what I think. I think you should knock out your credit card debt in 2014 once and for all! Oh yes, it’s time to pay off credit card debt! It’s time to hustle baby and get down to business. There’s nothing stopping you from making 2014 the year you finally kick your debt to the curb. You have to get pumped and excited just like you are training for a race. You know how people are always posting their running times and trying to run marathons? Well, that’s you – except you’re running one of the most important races of your life. You have to race against yourself and push yourself to change some habits. Debt weighs you down. It prevents you from enjoying your life. Get rid of it! Remember, paying off debt is just as uncomfortable as putting on running shoes at 5:00 in the morning. No one wants to do it, but they do it anyway for the benefit it will bring to their life. I promise you that you’ll absolutely love being debt-free. There’s no greater feeling in the world than being in control of your own destiny, so seize it and get going! There are so many people who think that they work hard. They claim their job is tough and their family life is tough and all they really want to do is sit on the couch in the evening and veg out after a long day. Well, you can veg all you want after your debt is gone. When you have credit card balances that you can’t pay off, you’ve got to work harder! Hustle! Walk up and down your neighborhood streets asking people if they need someone to shovel snow. Call up the newspaper and see if they need an extra person on their morning route. Get online and become a virtual assistant. Work harder than you’ve ever worked in your life to pay off credit card debt. I promise you it will not be fun to work all day and then work some more at night. I did it for 18 months in order to pay off my credit card debt earlier this year. However, once it’s gone, you can go right back to relaxing in the evenings. Remember, the pain is temporary, so get started now so it can be over soon. How many times have you caught yourself thinking, “Wow, life is so short.” Maybe a close friend of yours passed away or you heard about some senseless accident. You know how you feel when that happens, like you should just seize the day and enjoy every moment? That’s the feeling you need to harness to pay off credit card debt. That’s where the motivation needs to come from. Do you really want to spend every month stressed and freaking out about money? Does it give you anxiety when the bills come in and you’re worried you won’t have enough to cover them? If so, let’s get rid of that feeling because it’s awful. Trust me; I’ve been there. I’ve been in the Wal-Mart check out line and turned red in the face when two cards were declined. I’ve been the person refreshing my e-mail hoping to get my next PayPal payment so I can then turn around and give it to my landlord. It’s not the way to live, and I for one hope that I never, ever have credit card debt again. You won’t have to either, but you gotta hustle! Let’s make 2014 all about it! 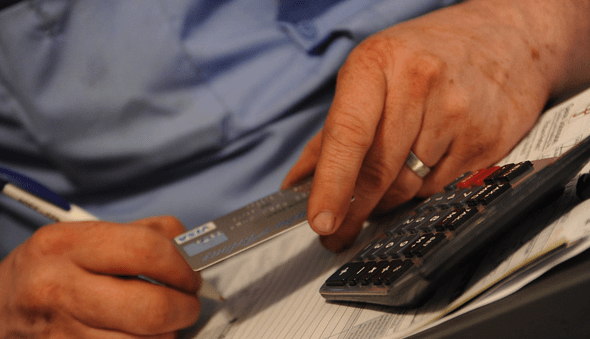 Do you have credit card debt to pay off? If so, what’s your plan for tackling it? What can you do to bring some hustle to your efforts? Great post, Cat! You’re so right- motivation is the biggest part of the battle- and also the thing that can help you the most on your debt payoff journey! Once you are completely motivated and committed, nothing will stop you until you make it to your goal! I couldn’t agree more, Dee. Thanks! Thanks! You are my fitness hero haha. I am not in debt but love checking those calculators that will tell you how many months extra payments shave off your debt, nothing like that for a good motivation. Oh yeah I love those things too!! Great analogy about how paying off your debt is the most important race in your life. We put so much unneeded stress on ourselves by overspending. As a former person in debt, I too can attest to how much easier life is when I don’t have to worry about how to pay my credit card bill each month. I know. It’s nice to know I can pay off the balance. Wasn’t always that way! Great post! We are over 3 years in on paying off our debt and it does feel like a marathon, but so worth it when we keep our eye on the end goal. $84K paid off so far and will be debt free in 2014! Can’t wait! Wow that is incredible!!! Awesome job Brian! Boy do I hate getting out of bed to run in the morning OR would love to veg out after a long work day. I do think it’s okay to have a glass of wine and watch some TV on occasion, but it certainly isn’t a great habit and those tendencies can trickle into other ares (like debt repayment!). Oh yes, glass of wine + a show is awesome. Dang I miss wine haha! Cat, thank you SO much for the motivation here today!! We did okay at tackling our debt this year, but we’re hoping to double or triple our efforts next year. Hey John, great article. I currently have $0 credit card debt…I’m loving it! I do have goals though, and I hustle hard to reach those! I think the most important thing to remember in any hustle is that life is short. The bottom line is, you’ve gotta make time to enjoy your life too! I know – I need to work on the life enjoyment part haha. Seems like I am always hustling! We have been debt-free for a few years. Yay! But this is definitely how you do it. You’ve got to hustle. Great post, Cat! We don’t have any credit card debt, but we do have $93k left on the mortgage. We could use these same principals to tackle that, right? Time to get pumped up again! Love this! I think once you “train” properly, you’ll find that you get really excited and energized by your debt-payoff journey that you’ll be eager to tackle it and accomplish your goals ASAP. It does take a lot of hard work but I think you learn to love that work especially when you start seeing all the awesome progress that you’ve made. So true. Progress = more motivation! Nice motivational post. We’re about to pay off a big chunk of cc debt this month that we incurred from our home renovations. Next year our goal is to get rid of the rest. Thanks! That sounds like an awesome goal! Great list, Cat! I agree that paying down debt is a lot like marathon training – there will be moments of discomfort but also joy, and you learn so much about yourself and your abilities through the process! Great post, Cat. And yes, you definitely have to train like a champion. Getting rid of debt takes hard work and dedication. It isn’t always easy and in fact some days it down right miserable. But the pay off – the pay off is so huge. Being financial free and able to spend your money on what truly matters is worth temporary pain. I agree. Can’t wait to get rid of my student loans and be 100% debt free. SUPER helpful tips! Hubby and I are currently working on paying off our debts, starting with credit cards. 2014 is gonna be our year, too! That sounds awesome Michelle!! Hope you rock 2014! Great post! I always complain that I’m tired and that I work hard but there are others that work harder. I only have one job and others have two even three. I guess I could clear my debts quicker with with a kick up the bottom. It is def easier to pay off debt by working extra but it’s def not fun to work so much for sure! i I don’t have credit card debt but I do have lots of student loans to pay off yet. We are trying to keep our eye on the prize. My plan is to work on earning some online income for 2014. Still strategizing though! Same here. No cc debt but plenty on student loan debt to keep us up at night lol. My number one piece of advice is to just keep hustling. You can really only pay off debt quick if you create more income. Most won’t get it from their jobs, so they have to get side income. It’s true. Working on the side is the easiest way to kick the debt payments up a notch! LOVE the analogy of putting on shoes at 5a to paying off debt. No one enjoys it. But once you have those shoes on (once you take that first step) it gets easier. Great article! I do not have credit card debt, but I do have quite a bit of student loan debt and mortgage debt. I also will likely have an auto loan within the next year. I think hustling is the way to go. My blog has forced me to sacrifice quite a bit time-wise but I’ve been so blessed by the financial payout that I’ve received from it. I currently am offsetting my monthly student loan debt payment with blog income. My next goal? Offset my mortgage. That sounds like an awesome goal. Working full time and blogging is definitely an intense schedule. I’m definitely ready to make the full time blogging switch even though it was great to have double income. I’ve gotten to the point where I’m not having to deal with credit card debt anymore. I still have balances the I run up but they are paid in full every month. This way I can take advantage of the cash back rewards and consumer protections that a credit card provides.